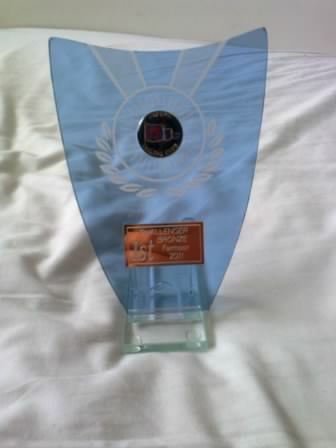 >This past weekend was the Challenger English Championships 2011. And as it was held at Oxford which is my “home” sailing club I was able to go. I went up Friday to help get things ready but it ended up with my Dad helping out and me sitting in the club house chatting to other sailors who I only see at these regattas. One of them gave me some really useful tips on racing skills so that was good and cleared up something I’d been confused about. Also, gossip and catching up is always good. Saturday started with the traditional pre-regatta bacon and sausage sarnie. After the briefing I was told it was suitable weather for me to go out (the fleet was going but it’s up to the individual helm whether they go and the weather wasn’t great) so got ready. We got me ready and on the water but unfortunately didn’t get far (we were only on the water about 2 minutes) when one of the safety crews came over and having already had to deal with two broken boats due to conditions told me that it wasn’t suitable for me and I should go in. As that was someone who is knowledgable about the type of boat I sail and knows my limits, my buddy and I basically went “if he says we go in, we go in.” Conditions had changed and those of us sailing with a buddy wouldn’t manage in what they’d got too. Challengers are great because you can sail single handed or with someone on the side if you need it but technically they aren’t designed to have the buddy so that was it. I sail alone most weeks but in the regattas take a buddy for support and confidence. Sadly the conditions hadn’t improved after lunch so I didn’t get out then either. I did enjoy my traditional regatta lunch of sausage chips and beans though and spent a pleasant afternoon chatting to people, reading and going for what for me is a long wheel. I didn’t enjoy the bit when I was 2 minutes away from being back inside and there was torrential rain leading to me being a bit soggy! When I later heard that during that storm the wind had gusted up to 37 MPH I was exceedingly glad I’d stayed on dry land. More than glad. I’d been told that there was more hope I’d be able to get out but that it was still going to be gusty so it wasn’t guaranteed. But it all worked out! Two races in the morning back to back and I managed to do both of those. That’s only the third time I’ve managed to do that. I wasn’t in the best position in the boat but it all worked out. We seemed to manage the course really well. As always I got lapped by the single sailors but I seemed to be much nearer the end of the course when they were half way round their next lap so that was better. Following another plate of the traditional sausage chips and beans and a change of clothes it was back on the water for the afternoon. We managed to get me in a much better position in the boat and fix the sail so it wasn’t as flappy. Things seemed much improved all round. The first race went well and I really enjoyed it. I was tired though and kept having short bursts of clonus which due to the position my ankle was in were painful (unusual as clonus doesn’t usually hurt but my ankle was in a v.weird position for me.). I really wanted to try the 4th race but on grounds of being able to transfer and move the next day and recognising that this is my first year where I can physically do 3 races a day I decided discretion was the better part of valour. I was a little bit worried by doing so I’d messed up my position in the rankings. And it was close but I beat my next closest opponent by 1 point and came first in the Bronze Fleet. Meaning that by some fluke I am the Challenger Class Association’s Bronze Fleet English Champion 2011. Not something I could have predicted but I’m really pleased and proud. This is the trophy that the champion wins every year and then gets passed on the next year. 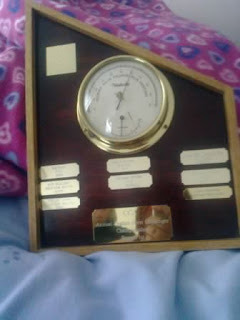 It’s made of wood and has a barometer in the middle of it with various brass plaques on it. At the top is the logo of the Challenger Class Association and at the bottom it says what the trophy is. The other plaques have people’s names on, their home sailing club and when they one. I’ll need to get myself one of those added. It’s a bit of a funny shape and I’m wondering if that’s because it’s supposed to look like a sail. I might ask. This is the trophy that I get to keep. It’s blue and originally I thought it was made of perspex but actually I now think it’s glass. It has a medal engraved on it and in the middle of that is a silver inlay with the logo of Oxford Sailing Club. Underneath is a bronze plaque, on the left of that it says 1st and then next to it it says Challenger Bronze Farmoor 2011 over 4 lines.